Cheese fondue is a simple dish as it is just a pot of melted cheese and wine into which people can dip almost anything they like. By strategically choosing the dippers, you can turn your cheese fondue into an interesting and impressive appetizer, or even a complete meal that will satisfy your guests while also providing balanced nutrition. From bread and crackers to a variety of vegetables and fruits, as well as meat and seafood, there are plenty of options to place around the fondue pot at your next gathering. Bread is the most popular dipper for cheese fondue, and you have many excellent options to choose from. French bread, bread sticks, and croutons are always favorites, but also consider multigrain bread, rye, sourdough, pumpernickel, and even bagels. Don't forget about unique breads, either, such as a rustic cranberry walnut loaf, which is fantastic when dipped in cheese. No matter which type of bread you choose, make sure to lightly toast it (especially bread that may fall apart in the cheese), and then cut it into large cubes. Other types of snack-style dippers to try are soft or hard pretzels (pretzels and cheese are a natural pairing) and wheat crackers or tortilla chips (think nachos). Vegetables and cheese are a favorite combination of adults and children alike, so of course offering a selection of vegetables with the fondue is only natural. And almost any vegetable will do--you just need to decide how to cook it beforehand. Vegetables such as asparagus, broccoli, bell peppers, Brussels sprouts, cauliflower, carrots, and zucchini are delicious if roasted first. Or steam some green beans, pearl onions, and radishes, or a variety of baby potatoes like Yukon Gold, fingerling, red, or purple. 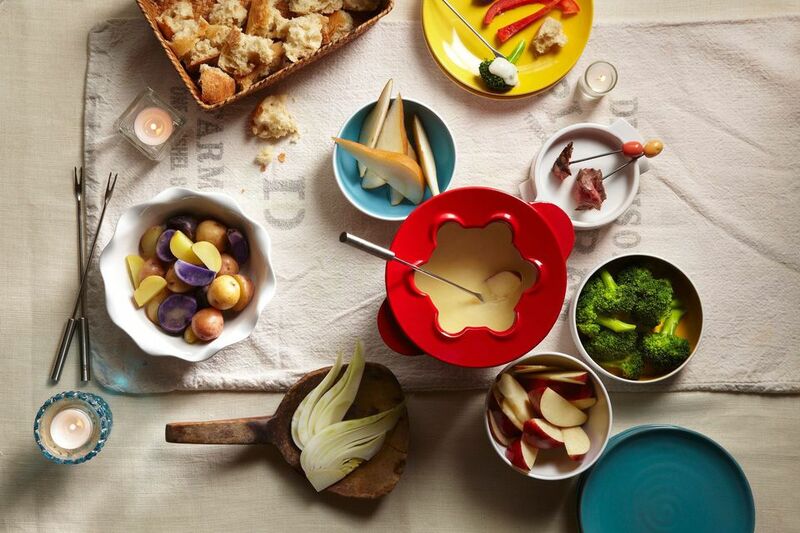 Sauteed artichoke hearts, as well as almost any mushroom (crimini, shiitake, oyster, sliced portobellos) are delicious additions to the tray of fondue dippers. And if you need something quick that can be served raw, try celery, fennel spears, carrots, and cherry tomatoes. Pickled vegetables—pearl onions, pickles, sweet gherkins—(that have been patted dry) are also a welcome dipper. Add a bit of protein to the platter and you've got a complete and satisfying meal that everyone—including the heartiest eaters—will enjoy. Feature a bit of grilled steak, poached chicken, or cooked ham, all which taste even better with a bit of melted cheese. Cured meats, like beef jerky, kielbasa, pepperoni, salami, and sausage are all fun and flavorful dippers that will bring a bit of spice to your fondue pot. Lightly steamed seafood such as shrimp, crab, or lobster would be an elegant and decadent offering, perfect for a special occasion. We may not think of fruit when it comes to fondue, but considering certain fruits have a place on a cheese platter, this pairing is certainly warranted. Serve raw or whole fruits like sliced green or red apple, sliced pear, pineapple, and seedless grapes. Allow guests to spear a few dried apricots or dried figs. Whether you are simply offering bread or putting together a platter of a wide variety of dippers, there are a few things to keep in mind when it comes to fondue foods. First, be sure that whatever you're dipping will hold together in a thick, warm cheese. For example, chunks of potato are great while potato chips are likely to fall apart. If you are choosing food that would ordinarily be cooked, don't forget to precook it before the fondue fun begins. Vegetables can be lightly partially cooked while meats should be fully cooked. Fondue forks are the best choice for dipping because they are color coded so everyone at the table knows which is theirs, and they are long-handled to avoid contact with the hot fondue pot. (If you choose to use ordinary forks, be sure they of a decent length.) It's important to avoid dipping fingers into hot fondue; this is both unsanitary and just asking for a burn. If you offer a wide selection of foods for dipping, you don't need to offer much else to round out the meal. Consider serving a simple salad and finish the meal with a fruit tart or a chocolate fondue.